The brush featured in this review has been discontinued. A new and upgraded replacement model has launched. The new version of this brush is the Oral-B Pro 2 2000 (view on Amazon). You can find out more about it and what we think of it by viewing our Oral-B Pro 2 2000 review. For those of you that are in a rush, we’ll start this review by answering the 3 most important questions about the Pro 2000. For those of you that want more detail, you can read the full Oral-B Pro 2000 review further down the page, or watch our video review. No, this is a great brush – we gave it a rating of 4/5. We cover the key pros and cons throughout the review below, but there really are few negatives with this brush. 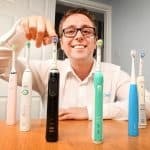 The cost is a little bit higher than a basic electric toothbrush but it offers a couple of advantages over and above cheaper models. The Pro 600 and Pro 650 are in our opinion the main alternative brushes to consider if you do not need specialist cleaning modes. The Pro 600 as one cleaning mode as does the Pro 650. The 650 boasts a travel case and sound connectivity too which are nice features, but the Pro 600 is value for money at its best. You do lose the pressure sensor, but realistically you should be able to tell if you are brushing too hard. Another possible option is the Philips Sonicare HX6511/50 which is no cheaper but boasts 3 weeks of battery life and one cleaning mode. If you’re shopping specifically within this price range, you may like to check out the budget recommendation of our best electric toothbrush article. 3. Where’s the best place to buy the Pro 2000? Below is a live price comparison from UK retailers, and it’s always worth checking eBay too. Simply getting the job done is what the Pro 2000 rechargeable toothbrush is all about. As a cost-effective brush, the Pro 2000 is one of the best selling electric toothbrushes available on the market today and for very good reason. No-nonsense, simple design and functionality that leaves you with a clean that not only feels, but is actually better than any provided by a manual brush. Watch the following video or read our detailed Oral B Pro 2000 review to find out what we thought about this brush having used it for a month. Slim and comfortable in the hand, I see no reason why anyone should take issue with the physical feel of this brush when in use. Unlike the slightly more premium brushes in the Oral-B range, the Pro 2000 does not have quite the same expanse of grippy rubber material on it, but there is an excellent array of strategically placed raised grips or contours to the chassis that reduce the chance of slipping in hand. The tasteful baby blue coloured front panel is a soft touch rubber that runs the height of the brush. Above and below the power button are a number of raised grips which your thumb naturally catches on. The single power button sits in a slight recess, but itself is pronounced and gives a tactile feedback. The lower third of the brush shows the battery power icon, above which is a small amount of branding. Turn the brush around and the smooth white plastic rear panel is home to an increasing number of raised grips which are practically placed and functional. At the top of the rear panel is a bold but stylishly designed red/orange plastic which illuminated red when the pressure sensor in the brush is activated. On the base of the brush is a recess into which the prong on the charging dock sits and charges the Pro 2000. Measuring just 2.5cm wide and 3cm thick and no more than 130g this is a comfortable brush to hold. Provided in the box with this brush is one CrossAction brush head. This head has a series of angled bristles which are designed to effectively remove plaque but also ensure they clean deep between the teeth and provide a good coverage over teeth surfaces. Whilst this is provided, you need not use this particular head. The benefit here is that Braun offer a wide array of different heads for their Oral-B brushes and you can purchase separately the ones best suited to you. It is possible, you may even interchange these. You may share the brush with other family members and as such each have your own brush head. Just grip the shaft of the head, pull firmly away from the brush and it will detach. To attach a new head simply line up the hole on the bottom of the brush head and push firmly down. When you power on the brush with a single press on the power button, you launch the daily clean mode. This lasts for two minutes and at 30 second intervals, you will hear the sound from the brush change as the oscillation of the brush head changes ever so slightly to indicate to change quadrant. At the end of the 120 second cycle, the head will again change its oscillation to give another tone to confirm the cycle has ended. You may continue brushing if you want. I do believe this timer is a highly underrated feature. Dentists globally advise cleaning your teeth for 2 minutes twice a day, but when cleaning your teeth how many people time it. This built in timer makes it simple. There is no excuse that you did not have a clock to hand. More premium rechargeable brushes do offer a visual clue through the pressure sensor that you need to change quadrant or the cycle is over. This is not a must have, but it can be handy. The Pro 2000 does not have this, but you will get used to listen to the audible tone, even if it is subconsciously. Oral-B’s SmartSeries brushes do too offer visual timers in the form of a wireless smartguide and even an app on the phone. These are functional and serve a purpose but are not required, but you do pay a premium for these. To switch the brush off when in the daily clean mode, you will need to press the power button twice. You need to press it twice as the first press launches the gum care cleaning mode. This gum cleaning option is accessible had the power button been pressed twice on first startup. Unlike the daily cleaning mode the gum care option will not be for everyone but is designed to stimulate and massage gums. During any cleaning cycle if you apply too much pressure the pressure sensor will illuminate red to indicate that you need to decrease this. The brush automatically reduces the speed of the brush head to reduce the risk of doing damage to the teeth of gums. After a short while you get used to the cleaning cycle and what pressure is required, but it is a good visual aid none the less. Whilst moisture inevitably builds up on the brush, the 2000 is easy to clean and the worst of the grime builds up at the base of the brush head, which is common amongst all Oral-B brushes. A good rinse and a wipe down with a cloth soon gets rid of this. I have noticed too a small buildup of grime towards the bottom of the brush where the fixed internal battery compartment meets the main brush body. I do not think this is an issue particularly, but another area to pay attention to, all be it, not as regularly as the brush head. Inevitably the battery will run down on the Pro 2000. With approximately 28 minutes of cleaning time. When power is low, the battery status icon on the front of the brush will illuminate red to notify you of this. Unlike some brushes the status icon for the battery does not flash to indicate remaining power after powering on or off the brush every time. Having used a wide variety of electric toothbrushes I do believe the power and clean offered from the Pro 2000 is as good as any of the more premium brushes, it just does not offer the range of cleaning options for those serious about oral hygiene. The Pro 200 should be used as part of a regime that includes flossing and the use of mouthwash. It is also worth noting that if you currently use a manual brush, but are moving to the Pro 2000, you may feel the cleaning action to be a little harsh for the first few cleans. This will be most obvious when the brush hits the gumline. Generally speaking this will be because your existing cleaning regime is not up to standard and the gums are sensitive. This will generally fade after about a week, but if it continues you should consult your dentist as you may have sensitive gums. The gum care mode on the Pro 2000 can assist with this. The slim profile of this brush does mean the battery life is impeded a little. It will last on average 7 days. That is based on 14 two minute cleans or approximately 28 minutes of brushing time. If you share the brush with others then you will find a charge more frequently necessary. Provided in the box is a charging station. Simply sit the brush on this and connect the 2 pin connector to a shaver socket in the bathroom. The 2 pin connector is not Braun being cheap and not offering a 3 pin connector for the UK, it is because they are designed to be charged from a shaver socket found in many bathrooms, which in turn use this 2 pin configuration. You can charge it from the mains with a 3 pin plug, you just need an adapter which are available in most supermarkets or hardware stores and cost just a couple of pounds. I have used this setup myself for years as I do not have a shaver socket in the bathroom. If battery life is an issue the brush can be left constantly charging, technology in it will stop it from taking more power than it needs. However, to prolong the life of the battery, it is good to run the battery down regularly and at least once every 6 months, deplete it completely. Charging is slower than most other electrical appliances, but if you leave it in the charging station all the time you will not need to worry. Available at prices typically ranging from £35 to £45 the Pro 2000 is a good value brush in my opinion. There are a few options listed in our comparison table above, but the best option we found at the time of writing was Amazon. There are some cheaper options and most certainly more expensive ones too — we have included a live price comparison here. Replacement brush heads come in at around £12-14 for a pack of 4 which is on par with most other brushes. Using the average price rather than the cheapest, assuming one user of the brush you will have a first year cost of £50 (£40 for the brush and £10 for 3 replacement brush heads). Ongoing costs will then equate to approximately £13 for brush heads and the small cost of electricity to charge the brush. Based on a 3 years of ownership, which is the length of the warranty with this product if you register the brush online with Braun, then the cost will come to approx £76 or just 7p per day. That is not bad value to keep your teeth healthy and clean. Of course use it for longer or between more of you and it can become even more cost effective. Whilst I noticed a little grime build up at the base of the brush head and around the battery compartment, a regular rinse and wipe of the brush will keep this in good condition. Designed to be subjected to water, toothpaste and saliva the brush will unlikely fail as a result of moisture, all be it failure to give the brush a clean every once in a while will reduce the chances of a long life. Oral-B’s extensive experience and research means the brush should easily last 3 years and for added peace of mind, register the brush online and you get a warranty that lasts this long. Regularly depleting the battery will ensure the battery life and performance is not affected and the 7 day brushing time remains achievable. As a more cost effective brush Braun do not include a travel case with the Pro 2000, so should you travel regularly, protecting the brush from damage is advised. They also do not include any form of holder or compartments for brush heads for different users which would be a nice to have. Whilst it does not offer some of the nice to have features of the premium brushes such as a visual timer or more cleaning modes the Pro 2000 is an excellent everyday brush that suits the needs of millions around the world. The battery life is acceptable, the design is inoffensive and it feels solid in the hand and is easy to grip hold of. Whether it is a child progressing to an adults brush, or a senior with more complex oral hygiene requirements and perhaps arthritis in the fingers, the Pro 2000 works well for many and in turn does not break the bank either. Be it your first electric toothbrush or a replacement to your existing, you could do a lot worse. Is the Pro 2000 an oscillating brush? No, the Pro 2000 has 2 cleaning modes. For more consider the Pro 3000, 4000, 5000, 6000 or 6500. With the Pro 2000 you get 1 brush heads included which is usually the Cross Action head. You can change the head with any others on offer from Oral-B. There are many that work with the brush handle. There are 6 main brush head options that include Cross Action, Floss Action, 3D White, Sensitive, Precision Clean and TriZone. Does the Pro 2000 have a pressure sensor? Does the Pro 2000 have Bluetooth? No, it does have Bluetooth connectivity. Does the Pro 2000 have sound connectivity? Yes, it does although it is not advertised with it. Does the Pro 2000 come with a warranty & how long is it? 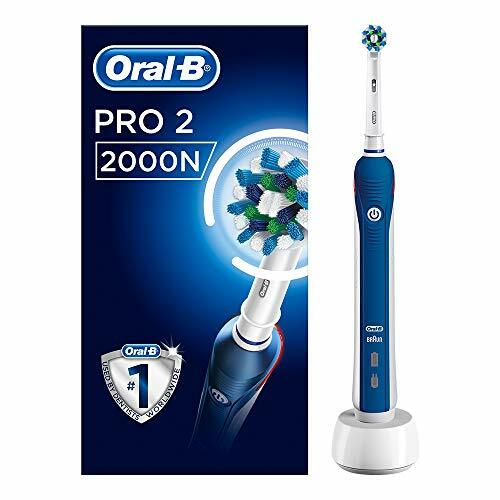 If purchased new from an approved retailer the Pro 2000 will come with a 2 year warranty which can be extended by a further year to 3 in total if you register the brush online on Oral-B’s website. Does the Pro 2000 have a built in timer? Yes. Often referred to as the quadpacer; subject to the cleaning mode the brush will provide an audible warning through a slight pause in the brushing mode to tell you to change quadrants. There are 4 quadrants to the mouth, and brushing is normally for 2 minutes. The timer will active at 30 second intervals, with a different sound at the end of the 2 minutes. No, the Pro 2000 does not have a wireless smart guide included. Yes, a charging station is included with the Pro 2000. The charger is a 2 pin/prong charger designed to be used on voltages of 220-240 volts It is a 2 pin charger suitable for connecting to shaver sockets found in many bathrooms in the UK & Europe. If you do not have a shaver socket, you can purchase an adapter that will allow the charger to be connected to a standard 3 pin UK mains socket. The Pro 2000 charging station or brush head holder has not been designed to be fixed to a wall. Can I use the Pro 2000 in the shower? Do you own or have you used the Oral-B Pro 2000? Thank you for the great review! Keep up the great work! Thank you for your comment and feedback on our review. I can confirm we have not included the number or oscillations of the brush heads as we felt that this information whilst relevant would generally speaking be a bit ‘heavy’ for most reviews, given that any of the brush range still provide a significant number of movements over a manual brush and in turn deliver cleaning advantages. We do however have a detailed break down of the cleaning modes and the power delivered from the motor or each model in this post explaining the cleaning modes. One persons opinion on what brush is suitable for them will differ to another. Typically we would advise that a ‘cheaper’ brush is perfectly adequate. However everyone has different perceptions of needs, wants and budgets. Like a car for example. A Ford Fiesta may do for everybody from travelling from point A to B, but some buy a Ferrari because they want to and can afford to. Sounds like you are really happy with the Pro 600 which is a great price for what it offers. I have lost the shaft of the pro 2000. Is it able to be replaced separately? Hi Christopher. Do you mean the metal piece that extends from the rush handle and to which the brush head connects? I have never seen such parts available for sale separately. I love my new brush but was surprised that at the end of the 2 minutes it carries on working and does not switch off as my previous brush did. Is this correct or do I have a faulty one? Glad you like it. No sadly it does not power off automatically like some brushes do. It likely has something to do with encouraging to brush for longer. How long will the replaceable battery last before it needs to be changed??? Unit is the professional care 2000. Thanks Please reply. Good question Maxwell. There is no specific life to the battery. The brush usually has a 2 year warranty where the battery is covered if it should fail. Some can fail sooner than others. We have a different Oral-B model still going strong after 4 years. Typically after 3 the battery becomes weaker not lasting as long. Normally rather than replacing or changing the battery we would advise buying a brand new brush. Thank you for the deep analysis of this Pro 2000 as well as Pro 600. I am trying to compare the speed (oscillates, rotates and pulsates) of these two models, but unsuccessful in any website. Do you have this information? 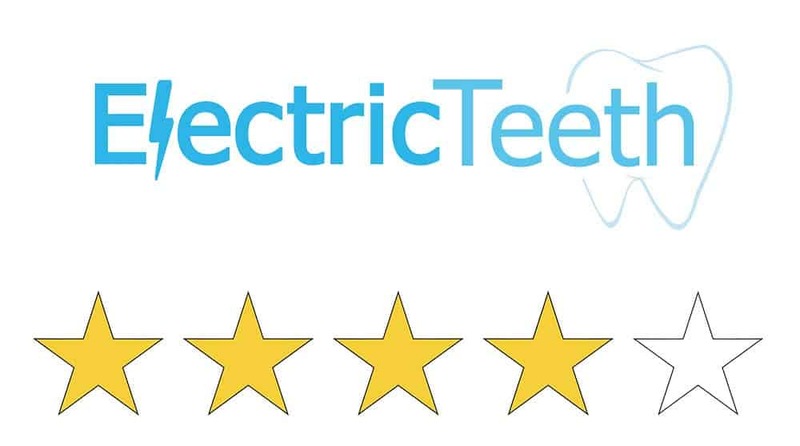 I am not sure if this will be of assistance, but in this post we discuss the cleaning modes: https://www.electricteeth.co.uk/oral-b-cleaning-modes-explained/ and the oscillations and pulsations used. I am not aware of each brush having a different number of these but it is possible. Although the post indicates the oscillations and pulsations are the same for P600 and P2000, retail shops display the information differently for these 2 models: P600 – 20,000 oscillations and 8,800 pulsations; while P2000 has 40,000 oscillations and 8,800 pulsations. Likewise for Vitality series, it is a 2D with 7,600-8,800 oscillations. All these information are not displayed in the manufacturers’ package of in Oral B’s website. Thank you very much for your thourogh review. You are providing greate service to the puplic. I only wish I could find this level of review for other healthcare appliances. Thank you. What other healthcare appliances are you failing to find such detailed reviews of? Ohh.. . Too much to read ! Jargon is the bane of my life….why can’t people use simple English…..for instance, what the hell does “change quadrant” mean?????????????? Sorry Hugh, we try to keep the jargon to a minimum or avoid it. 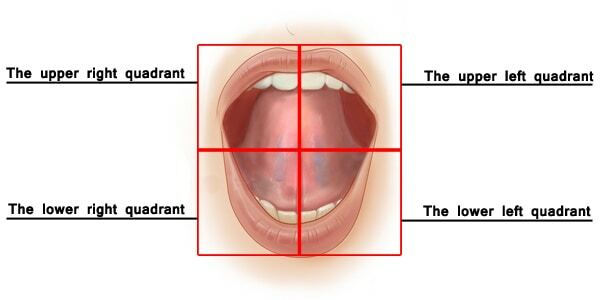 Quadrant refers to 4 sections of your mouth/teeth. You have the top and bottom teeth and then the left and right side of each. This image hopefully describes it best.